Third in a series on games I loved, but no longer play. You can find Part One: Rolemaster here and Part Two: Champions here. I fell into Rolemaster and Champions because I followed the games others played. In both cases the slightly older generation of gamers ran with those systems. I tagged along, eventually buying in fully. My friend Jim’s mentioned that he started with Champions and rarely played anything else. In my case I tried many different games, switching around constantly. I wanted to be the person found a system everyone loved; so I ran Ringworld, Ghostbusters, Paranoia, Stormbringer, and James Bond. I relished new games and I had my ego invested in gaming. But none of those games took off. Then in 1985 Man to Man came out from Steve Jackson. I’d played Melee and Wizard, as well as buying most other SJG micro-games. We had a player in our group who’d loved The Fantasy Trip. He ended up running M2M as an arena fantasy campaign where we fought for our lives, bought our freedom, and then tried to make it as huntsmen in the wilderness. We liked the system for the flexible character creation and the mix of crunch and simplicity to the combat. 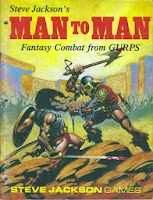 The following year, SJG published GURPS which took the M2M combat engine and built a great point-based system around it. I loved it right away. I picked up everything that came out for it in that first run- GURPS Autoduel, Horror, Horseclans, and most of all Fantasy. I ran an Amber-inspired campaign with multiple dimensions, Gamma World-like weirdness, and an 'anything goes' vibe. We got many things wrong in those early days: for example we realize Magery had a limit or that Passive Defense wasn’t always used as an extra defense roll. The campaign I ran was bad, but served as a shakedown cruise. I got out of my system the concept that because you could do anything, you should do everything. My next campaign became the basis for the fantasy world I’ve ended up running since then. In ’87 I ran a GURPS fantasy campaign where players had no character sheets and had to work out what they could do. I run it fully improvised for four sessions. A few months later I decided I wanted a solid and ongoing fantasy campaign using GURPS. I needed a system which I could easily adapt. I used everything I’d spun in that mini-campaign and fleshed out the setting. 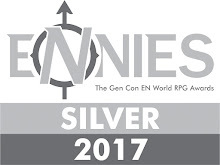 Then I ran it for the next three years- a campaign that ended up with a dozen and a half players coming and going, and finished with a solid group of seven, two of whom I still play with and one of whom died not that long ago. Running a fantasy campaign with low-powered characters shifted my thinking about gaming. Combats could kill or maim easily. The PCs fought mostly humanoid foes and enhanced beasts. Late in the campaign I unleashed a Beholder on the group, which killed one character and sent another into a fear-induced panic. You didn't kick the door in and fight the dragon; you had to play smart. GURPS became our go-to pick-ip game. The older group of gamers didn’t really buy into the system, so we felt like trailblazers. And of course we entered into the inevitable system and edition arguments. When the GURPS 2e arrived, we bought that up. Within our group you could count at least one player owning every supplement. We had three to five GMs at any particular time running Space, Modern Espionage, Conan, The Wheel of Time, Pulp Action, Horror, or Samurai. Supers proved to be the one exception for us. We had Champions or DC Heroes for that. And frankly GURPS Supers was pretty dire. Clunky, rough, and oddly constructed. It felt tacked on. I ran GURPS through several more fantasy campaigns with my ongoing setting. When I studied in Cairo, I only took the GURPS core book with me and ended up running for a great group. However, over time I began to wonder about the limitless chrome offered by Rolemaster for fantasy. Perhaps my game world suffered because the system kept it so restrained and low-powered? For the next campaign, I used RM. The tonal shift and strange feeling hit right away. It just didn’t work. My world had certain premises- tough heroes fighting against desperate odds to bring down evil. The power creep of RM worked against that. Eventually I relegated that system to another continent of the world and kept the core setting more realistic or at least more reasonable with GURPS. That’s what GURPS does well- really well. It helped define years of fantasy games and shape the feeling of the setting. I ran three parallel three-year campaigns with it and then another several including a four year steampunk/ swashbuckling fantasy game. Everyone knew GURPs and we played the hell out of it- which meant we also saw flaws. For some GM's armor felt weird and we tried a couple of variations on that, including on quite striking ‘piecemail’ approach. We also worked on options to break out Will and Perception. Over time we restricted certain advantages as too potent, or limited them to one player per campaign. We cut out even many disadvantages- those which cause more problems to the rest of the group than the player who’d bought them (anything about being Stubborn, a Loner, Bad Tempered or the like). But we also worked to smooth the game- skipping many of the crunchy bit details about number of seconds to do certain actions, working out ranges for everything, multiple turns to stand up, and basically all of the deeper bits of the combat system. You might call what we ran GURPS Lite Lite. But we hit the most problems with the Magic system. Just to be clear- I love GURPS 3e. At a conservative estimate, I’ve run 350 sessions of fantasy using GURPS. In the early days, we only had one or two persons in each campaign willing to take on the responsibility of being the magic user. That made them unique and meant I didn’t have to pay all that much attention. But over time I began to see problems with the mechanics. GURPS Magic feels like the designers built it to keep power gamers in check. The effects and mechanics are tight and limited. Unless a spell-caster concentrates on an extremely narrow path, they’re never as effective as a sword-wielder. I heard players complain about this over the years, and I usually dismissed that as a non-issue. Yes, fatigue and mana limited them, but they could buy their skills higher to compensate. Yes, they weren’t as effective in combat, but they had so many more options. Yes, they had multiple rolls and resistances to get through for a modest impact, but hey they did magic. Eventually I began to see the problem for our group- magic felt unsatisfying and frustrating for those who played it. Even veteran players who knew the system felt tied down. We experimented with several variations, notably Infinite Mana, but those felt like band-aids. 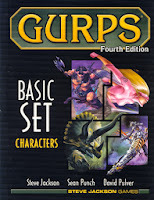 Then as we finished up a big multi-year campaign, SJG came out with GURPS 4e. The reaction from our group was a universal meh. Everyone owned and had bought into GURPS 3, but no one except me felt like forking over the money for a new edition. More 3e stuff- sure, but no one wanted a new version. I bought it anyway- the nice collector’s set in the slipcase. And I didn’t care for it. I disliked the layout and I disliked the new and much more complicated approach to character building which felt like second-hand Champions. The few modest changes they had made- to costs for Strength and the method for Passive defense made sense, but little else worked for me. Still, I held out great hope for the revised version of the magic system. Perhaps now we’d get a more flexible, interesting, and less straight-jacketed set of ideas. We didn’t. GURPS Magic 4e ended up bundling together the previous two spell books and only making changes to fit with the core shifts. I even held out hope that the new GURPS Thaumatology would offer other options, but if anything it presented other dense mechanics, equally or more restrictive. And that was it for us. 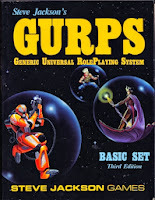 I suspect everyone still has their copies of GURPS 3, but we haven’t played it in eight years. I don’t see if popping up anytime soon. 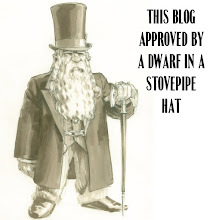 GURPS offered some of the best low-powered adventuring, but we’ve moved on to other games. Perhaps we might take it up again, but I doubt it. It has likely entered into the graveyard of games for our group. It is recalled fondly and much beloved- and I suspect many of the awesome sourcebooks will stay on our shelves for years. Requires a good deal of hacking to get it into the shape you want (social combat, alternate magic, etc). The campaign I play in uses GURPS 4E, and the GM has even become a regular on the SJ Games boards. Two of our players have taken great joy in the main magic system, which makes them far more deadly than any of our fighters. Glue trap, followed with either Fireball or Rain of Stones (spell names from memory, I'm not the wizard). I was really disappointed with GURPS 4E Thaumatology too. It promised to include the Ritual Magic System from 3E sourcebooks like Voodoo but instead gutted it and made it part of the regular magic system. 3E Ritual Magic was great, though I've never seen it in play. Effects tended to be literary instead of mathematical: something truly good or bad happens (unexpected injury or monetary windfall), use your imagination at the table to describe what. 4e was utterly horrible in my opinion, and killed GURPS for the majority of gamers worldwide. 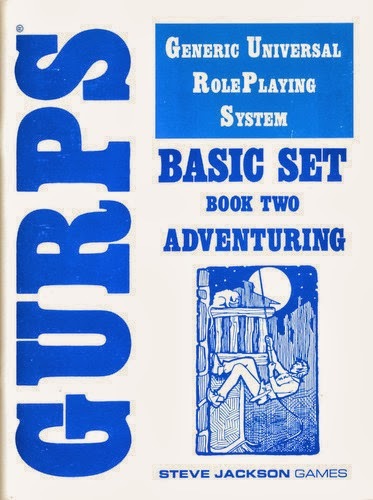 GURPS 3e was the second RPG rulebook I ever bought. I was a total newb to gaming, but I could already see the appeal of a flexible, "universal" system, and I was quite taken with the possibilities offered by the character creation system. I could never really sell it to my group at the time, however. I actually welcomed the advent of 4e, because it collated and streamlined all those disparate rules that had accrued over 3e's run into two core books, and it felt like a chance to give the system a fresh start. Also, I think they've done a pretty good job with the supplements of just building off of what's in Core rather than inventing whole new systems whole cloth, so that's admirable. (Of course, this has its own downside, as seen with Thaumatology.) But, as you indicated, 4e seems to have moved the system firmly into the camp of the gearheads and the number-crunchers (the system's core audience these days, so I can't really fault SJG, but still...). If I could reach a point of being a sort of walking encyclopedia of GURPS, I'd probably make it my sole system. Because I'm still in love with the system's flexibility. But a lot of the people I game with aren't into it for the mechanical side. If I gamed with a bunch of crunch-lovers, that would be a different story, but GURPS requires a certain medium-high level of rules buy-in from players if you want to play it "conventionally" (i.e. without designing everyone's characters for them or being the only person in the group who knows the rules). Plus, every time I read detailed system discussions and dissections, I am reminded that I too have my limits in terms of crunch. I like crunch in concept, but my actual tolerance level is pretty low in practice. BRP and Savage Worlds are much more my speed. Plus, they're more forgiving of player or GM rules mistakes; I once ran an "intro combat" with boffer weapons that should've ended after 3 turns and instead turned into a brutal slugfest, ending with a PC breaking a leg, because I mis-remembered a couple injury rules. I'd argue that 4e pushes a lot of support for the non-gearhead, non-number crunchers. There is a lot more support for dramatic play and rules-light play than 3e. I write a lot of crunchy stuff, but I also explicitly write rules that support non-crunchy non-detailed play - and run games with both. I think "4e is is 3e for gearheads" is a real disservice to 4e. This is not to say it's the game for you, of course. That's an interesting take on it. As a 3e vet, certainly that wasn't my perception when I went to try out 4e. And I bought in fully, buying and reading multiple books (even replacing them after the fire). And certainly it felt much more crunchy and gear head focused- certainly more than 3e and harder to smooth out the edges. But I also stopped buying after GURPS Thaumatology and Martial Arts 4e- more recent material may have taken a different tact. The shift away from crunch in 4e is illustrated in Vehicles being replaced/dropped, supers stuff being baked in to the Basic Set, and Psionics rules evaporating into the powers system. 2e stuck me as very limited and focused on a particular stripe of realism. I came back to gaming at the tail end of 3e and literally threw it against the wall in frustration-- you needed six books to run anything. With 4e Basic Set... everything else is truly optional again and I can pretty much run anything with the core rules anyway-- which it how things should be with GURPS anyway. Amusingly enough, GURPS 3e is one of those games I loved, but I'd never play again. Unlike you, though, it's because I really love what 4e did with the system. I found it made everything much easier, including chargen. So the change caused you to abandon GURPS, but for me, just to toss 3e to the curb for what I feel is a much-superior iteration of the game. And that isn't always true - If you think the D&D edition wars were bad, wade into the Shadowrun conflict - but I, who adored 3e and played it to literally the exclusion of all other systems after a time, have come fully into the 4e fold. It is funny how a new edition of a game can have an effect on people even if it is never played. I have a similar feeling as the author about GURPS 3E vs. 4E and while 3E it was never our main game it was one of the candidates whenever a new game was started. Once a new edition was released that disappeared - no one wanted to buy new books but there also wasn't much interest in playing an "old" game. So neither one has made an appearance at the table in the last 9 years.